By: Dina Sorensen, Associate – VMDO Architects, Mary Moss Brown, Founder – Charlotte Lab School, and Jeri Brittin, Ph.D., Director of Research – HDR Inc.
Learning and moving inside and outside the classroom – seems like a simple idea that is easy to do – but we know from research and everyday life that ‘moving’ for well-being is easier said than done. Daily physical activity and movement in schools is a topic that has been embedded within American culture since the advent of all day school in the early 20th century. But our times and our built environment have systematically re-engineered school culture toward a predominately sedentary one, leaving us as designers, researchers, and educators begging the question of how to anticipate and provide for the natural need TO MOVE TO LEARN for all children, youth, and adolescents as part of their daily routine. When well-being is one of the top priorities of the 21st century school agenda, approaches to integrate movement competencies at school that include all students is a call to align the design of policies and places with the health benefits of people and environment. Physical activity has a profound effect on children’s current and future health (IOM, 2013), and is positively associated with classroom behavior and learning (Carlson JA, Engleberg JK, Cain KL, et al. 2015; Tomporowski PD, Lambourne K, Okumura MS. 2011). In school, children can be sedentary for up to 70% of class time, including physical education class and breaks (Nettlefold L, McKay HA, Warburton DE, McGuire KA, Bredin SS, Naylor PJ. 2011). Children spend a large proportion of their waking hours in school, and increasing children’s physical activity at school has become a national focus to address childhood obesity and related diseases. Despite this focus, research shows the majority of children and youth – globally – are not meeting basic recommendations focused on moderate-to-vigorous physical activity (MVPA), given associations with health and the U.S. recommendation that children spend at least 60 minutes per day in MVPA (Nat’l PA Plan 2016; US Dept of Health and Human Services 2008). In addition, analyses of data collected as part of the 2007 National Survey of Children’s Health also provide evidence of disparities in physical activity among children with disabilities compared to those without. Many children with learning disabilities, attention-deficit/hyperactivity disorder, and functional limitations are less engaged in physical activity compared to children without disabilities. Therefore, promoting physical activity among all children, including those with disabilities, deserves attention as it points to areas of much needed innovation and intervention for a holistic view of total physical activity, including light-to-moderate intensity, that contribute to total health and well-being (2016 U.S. Report Card on Physical Activity for Children and Youth). What happens when best practices in wellness converge with innovative approaches to architecture for learning in the early 21st century? Students get to move again! And in the process, they become more motivated, more engaged, and better agents of their own learning inside and outside of the classroom. Recently, at the Green Schools Conference in Atlanta, I partnered with Mary Moss Brown, Founder and Head of School at Charlotte Lab School (CLS) in Charlotte, North Carolina, to explore and highlight examples of ‘Green Schools that Move’ as the connection between design and pedagogy, as well as the growing importance of movement in students’ success in schools. Human beings are made to move, most importantly kids. We all know that because, as teachers and parents around kids every day, we see how natural it is for them to move. It is the only way they make connections between their body and mind. Without movement, it is not possible to sustain health or happiness and brain activity is reduced. Teachers probably witness a lot of that natural joy when the kinetic connection between learning is encouraged but even more powerfully, when it is designed to happen in their everyday school environment. We have a dilemma in most schools because teachers manage a lot of kids and a lot of learning activities. With only so much time in the day, the tendency to fall back on the traditional approach requiring kids to be sedentary most of the day and to follow instructions is common – even when those instructions might go against their very powerful biological drive to move and engage in a complex environment. Evolutionary biology dictates that natural movement. When we do not allow kids to move naturally and often enough, we close off a big part of their ability to learn. Research has shown that physical activity, well-being, and learning are all impacted by teaching practices, policies, and physical spaces that take into account a student’s mental, physical, and emotional development. What if there was a way to give kids more freedom to move in a way that their bodies are evolutionarily designed to do throughout the day and still maintain a sense of flow and productivity? What if we could increase both learning and psychological well-being through the very design and architecture of our schools and classrooms? We often think of sustainability as caring for our natural environment. We do not often connect it with school-based health promotion initiatives. What if sustainability was about not just caring for and preserving earth’s natural resources, but also caring for and preserving the well-being of the future stewards of those natural resources – kids who are currently in our school systems? Kids today statistically face a higher likelihood of having to fend off obesity, early cardiovascular disease, diabetes, and cognitive issues related to attention and memory as part of their childhood. Natural and kid-friendly habitats like parks have been severely reduced and are harder to access without parental control. We need to re-sensitize ourselves to these facts and then commit to a new paradigm for the health and well-being of future generations. Many studies of school built environment characteristics and children’s physical activity have measured MVPA, while only a few studies included sedentary behaviors as an outcome (Brittin J, Sorensen D, Trowbridge M, et al. 2015). A systematic review concluded that provision of activity-oriented facilities, such as gyms and sports fields, was positively associated with physical activity during recess (Ridgers ND, Salmon J, Parrish A, Stanley RM, Okely AD. 2012). 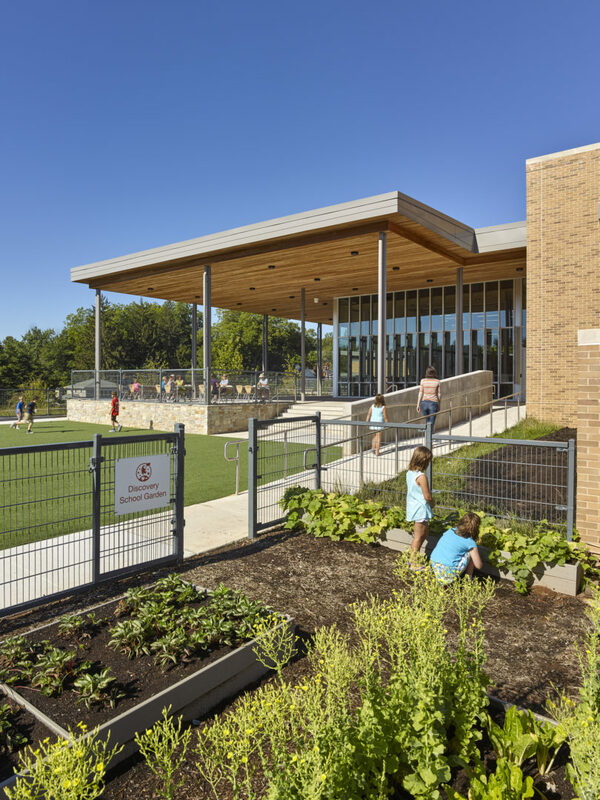 Among longitudinal studies that have addressed school built environment effects on physical activity, school environmental variables have included exterior features such as gardens, (Wells NM, Myers BM, Henderson CR. 2014) playgrounds, and outdoor recreation and recess areas, (Stratton G, Mullan E. 2005; Toftager M, Christiansen LB, Ersboll AK, Kristensen PL, Due P, Troelsen J. 2014) as well as the conduciveness of school surroundings for active commuting (Toftager M, Christiansen LB, Ersboll AK, Kristensen PL, Due P, Troelsen J. 2014). Several small-scale longitudinal studies have addressed physical activity and school classroom features intended to reduce students’ time spent sitting. A review of 13 such studies concluded that a range of approaches, including incorporation of stand-biased and ergonomic versus conventional furnishings in classrooms, were effective in reducing students’ daily sitting time by 44-60 minutes (Hinckson E, Salmon J, Benden M, et al. 2016). Kids need to move to learn which means the right health-promoting design and programmatic ingredients need to work together to allow for a seamless user experience for both teachers and students. Our emergent work has focused on designing learning environments that integrate features to promote MVPA all day long to provide kids with the best context for joyful learning, better health, and lifelong healthy habits. What it means to be ‘active’ based on research and in a real-world school context at CLS is fundamentally about the natural relationship between learners and their environment as the Third Teacher, and about improving their well-being by strengthening that natural relationship. Enriching school spaces with the right elements, like a variety of furniture types and outdoor amenities like school gardens should aim to find and give all children, not just the “sporty” ones, the freedom and opportunity to move as one of their basic human necessities. Learning spaces need to be what kids love; sparking, speaking to, and engaging each child’s unique, spontaneous expression for movement as part of their creative learning capacity. And educators are the change agents when it comes to transforming learning into a culture of healthy choice and a sense of well-being. One example of an engaging instructional model that puts students at the center of their own learning is showcased at CLS. Their model is made possible through a non-traditional, flexible school space, combined with varied furniture and an intentional commitment to movement throughout the school day. CLS has observed first-hand the impact of space, furniture, and intentional movement on a student’s daily experience at school and in creating a learning environment that will truly prepare students for the world of tomorrow. What Does a ‘School in Motion’ Look Like? Large mobile work tables and varied seating arranged in groupings support frequent student collaboration, which not only plays an important role in students’ learning, but is a skill for long-term success in team-oriented environments. Higher order thinking skills are activated when students are collaborating in project-based learning in which critical, logical, reflective, metacognitive, and creative thinking skills are applied to encounters with unfamiliar problems and uncertainties (King FJ, Goodson L, Rohani F. 2011). Appropriate learning environments that facilitate collaborative practices to facilitate growth in higher order skillsets are flexible, moveable, and amenable to easy physical re-configuration. As students develop these more flexible, open-minded attitudes, the learning space responds by offering choice, comfort, and variety. While open spaces, windows with views, and bright colors can first appear distracting, varied seating options – which sometimes do not involve sitting – and flexible classroom walls or visual boundaries provide students and teachers with infinite opportunities to find the right places for learning. Whether it is furniture that promotes natural movement like fidgeting, sharing time in a circle, or providing clipboards for students to pick a place to work laying down, CLS experiences strong student engagement and focus on learning. Furniture choices not only support student learning but also provide opportunities for students who need to tune out distractions, something that is common in contemporary, open work spaces. Additionally, scheduling time throughout the school day for “brain breaks” (which include various stretching, dancing, and movement activities) and “mindful minutes” (quick mindfulness and meditation strategies) enable all students to stay engaged and on-task while promoting life-long strategies for regulating emotions and better controlling reactions to conflict or obstacles, developing in students the kind of resilience that is so necessary for success. Part of the process of guiding students to become owners, or agents, of their learning requires that they have opportunities for trial and error related to what works best for them as learners, collaborators, and creators. 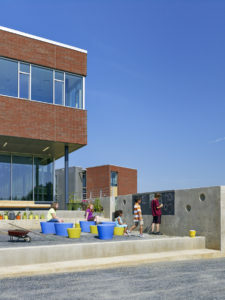 Utilizing nature as a playground and school gardens as extensions of a flexible school setting, varied seating that doubles as an element for play and relaxation – coupled with an instructional approach that promotes student decision-making, independence, and choice – supports the development of healthy mindsets related to personal wellness and academic success. Student agency, or empowerment, anticipates the tools students need to transform and influence their world. Indoor natural elements and provisions for active play and learning from nature outdoors are instructional tools that have been shown to be highly effective at motivating kids’ natural inclination to move. It has been established that children are more physically active outdoors versus indoors; (Baranowski T, Thompson WO, Durant RH, Baranowski J, Puhl J. 1993; Skala KA, Springer AE, Sharma SV, Hoelscher DM, Kelder SH. 2012; Klesges RC, Eck LH, Hanson CL, Haddock CK, Klesges LM. 1990) therefore, school design should consider quick access to the outdoors to promote running and other moderate-to-vigorous activities that are generally not allowed in indoor areas. Combined with the right mix of equally compelling indoor options for movement, such as flexible, dynamic furniture; varieties of soft and structured elements; and unique ‘get-aways’ or ‘movement temptations’, every learner is ensured to have appropriate choices for their learning style and the activity at hand. 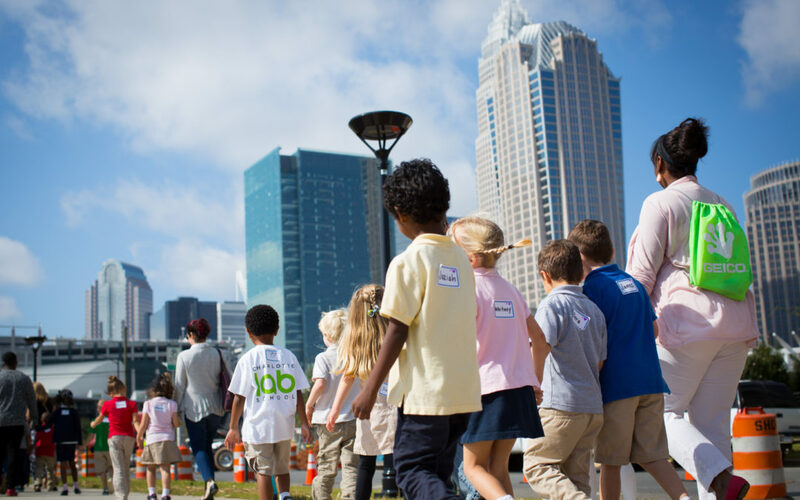 At CLS – the same independence to play, explore, and learn indoors is equally encouraged outdoors for all students. As an urban school with limited green space, alternative seating and a commitment to building movement into the school day is even more critical. These two examples, furniture as a choice and a resource and the inclusion of school gardens as tools for empowerment, are two of the strongest evidence-based design domain examples from our Physical Activity Design Guidelines for School Architecture – the first ever systematic review of existing evidence on the role of design in advancing the design of less sedentary environments for learning. When people think about schools, they typically imagine rows of desks and chairs; however, what research and personal experience tells us is that sitting in a hard seat for hours at a time is actually not the best way for kids to learn. And sitting for the majority of the school day has a negative impact on health and well-being. The growing connection between design and pedagogy has placed equal importance on spaces designed to promote both low-to-moderate movement and moderate-to-high physical activity for total physical activity, health, and well-being in schools. But to affect health and learning toward a culture of well-being in schools calls for the integration of policies, places, and people prioritizing movement-rich pedagogy each and every day for every child. Our hope is to inspire a new movement in Green Schools – that Move! Institute of Medicine (US). Committee on Physical Activity and Physical Education in the School Environment. Educating the student body: Taking physical activity and physical education to school. Washington, DC: National Academies Press; 2013. Carlson JA, Engelberg JK, Cain KL, et al. Implementing classroom physical activity breaks: Associations with student physical activity and classroom behavior. Prev Med. 2015; 81:67-72. Tomporowski PD, Lambourne K, Okumura MS. Physical activity interventions and children’s mental function: An introduction and overview. Prev Med. 2011; 52:S3-S9. Nettlefold L, McKay HA, Warburton DE, McGuire KA, Bredin SS, Naylor PJ. The challenge of low physical activity during the school day: At recess, lunch and in physical education. Br J Sports Med. 2011; 45(10):813-819. National Physical Activity Plan. 2016 U.S. Report Card on Physical Activity for Children and Youth. SHAPE America, American Council on Exercise, and American Academy of Pediatrics. Production and design supported by the Pennington Biomedical Research Center and SHAPE America. Physical Activity Guidelines Advisory Committee. Physical activity guidelines advisory committee report, 2008. Washington, DC: US Department of Health and Human Services. 2008: A1-H14. Brittin J, Sorensen D, Trowbridge M, et al. Physical activity design guidelines for school architecture. PloS One. 2015; 10(7): e0132597. Ridgers ND, Salmon J, Parrish A, Stanley RM, Okely AD. Physical activity during school recess: A systematic review. Am J Prev Med. 2012; 43(3):320-328. Wells NM, Myers BM, Henderson CR. School gardens and physical activity: A randomized controlled trial of low-income elementary schools. Prev Med. 2014; 69:S27-S33. Stratton G, Mullan E. The effect of multicolor playground markings on children’s physical activity level during recess. Prev Med. 2005; 41(5-6):828-833. Toftager M, Christiansen LB, Ersbøll AK, Kristensen PL, Due P, Troelsen J. Intervention effects on adolescent physical activity in the multicomponent SPACE study: A cluster randomized controlled trial. PloS One. 2014; 9(6):e99369. Hinckson E, Salmon J, Benden M, et al. Standing classrooms: Research and lessons learned from around the world. Sports Medicine. 2016; 46(7):977-987. Baranowski T, Thompson WO, Durant RH, Baranowski J, Puhl J. Observations on physical activity in physical locations: Age gender, ethnicity, and month effects. Res Q Exerc Sport. 1993; 64(2):127-133. Skala KA, Springer AE, Sharma SV, Hoelscher DM, Kelder SH. Environmental characteristics and student physical activity in PE class: Findings from two large urban areas of texas. J Phys Act Health. 2012; 9(4):481-491. Klesges RC, Eck LH, Hanson CL, Haddock CK, Klesges LM. Effects of obesity, social interactions, and physical environment on physical activity in preschoolers. Health Psychol. 1990; 9(4):435-449. General reference: VMDO Architects. We move schools forward. http://wemoveschoolsforward.com/designing-for-health/. Updated 2017. Dina Sorensen brings her unique background in the arts, architecture, and interdisciplinary research to enrich the design of every contemporary learning environment. As a designer, author, and speaker who spearheads interdisciplinary collaboration, Dina believes in the courage to transform assumptions into questions about the human experience when aiming to create social learning spaces that foster agency, creativity, diversity, and a symbiotic relationship with nature and technology. With a special focus on designing for health, her primary research investigates the influence of school design on healthy eating and physical activity, catalyzing the connection between public health and architecture. Dr. Mary Moss Brown serves as Charlotte Lab School’s Head of School. She is the co-author of How to Innovate: The Essential Guide for Fearless School Leaders (Columbia University Teachers College Press, March 2014) and was an elementary, middle, and high school teacher for seven years, working in New York City, Atlanta, Boston, and Fayetteville, North Carolina. Mary then served as a principal for seven years of two technology-rich, student-centered start-up schools in the New York City Department of Education, including Mott Hall II, a progressive one-to-one laptop middle school. As Co-Founder of the NYC iSchool, New York City Department of Energy’s pilot high school for 21st century learning and innovation, Mary specialized in the development of challenge-based curricula designed to give students an opportunity to apply 21st century skills in the context of solving real-world challenges, the development of students’ online learning skills, and designing systems to enable personalization and mastery-based individualization of the learning process. As a public health research scientist with a design and business background, Jeri Brittin’s strategic orientation informs her work at the crossroads of environmental design and human outcomes. She believes that design, as it defines and shapes spaces, should be leveraged to achieve outcomes that matter to people, organizations, communities, and populations. Derived from public health science and based on a social-ecological framework, her recent research highlights the critical role design plays in health outcomes.